Welcome back to this week's edition of the BEST blog interview. Follow me to Austin in Texas, to meet Iliana Perez-Zeyda of Bookgirl’s Studio, maker of beaded journals and scrapbooking supplies made out of paper. Hi Iliana, nice to meet you! Tell us a little more about your shop and your crafting: What do you make and sell? Currently the majority of books I make are small journals with decorative beads on the spine. I love shopping for paper, as there always seem to be new papers and which means new color combinations to use. 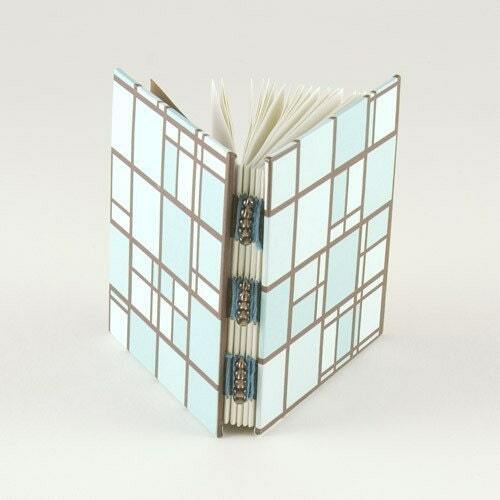 I love the look of Coptic bound journals and try to offer those as well. I’m only offering books now but have plans to add some other paper products. But you are already offering scrapbooking supplies? Currently I offer blank journals and some scrapbooking/collage supplies but in the future I hope to offer other paper goods. Where is the source of your inspiration? Do you have a special way or place to get ideas? Going to the bookstore is the biggest source of inspiration for me. My husband and I go at least once a week and hang out reading magazines and books. I’ll look through a wide variety of magazines, not just on crafting, but anything that will make me think of a new color combination, a new way to do a binding or a new technique I’d like to incorporate in my craft. I think reading about different arts and crafts is a great way to jumpstart your creativity. Is there a story behind your Etsy-Name? My Etsy name came because of my blog. I started a book blog in 2004, Bookgirl’s Nightstand, where I talked about my love of reading. I talk about books I’ve read, books I wanted to read and so on. 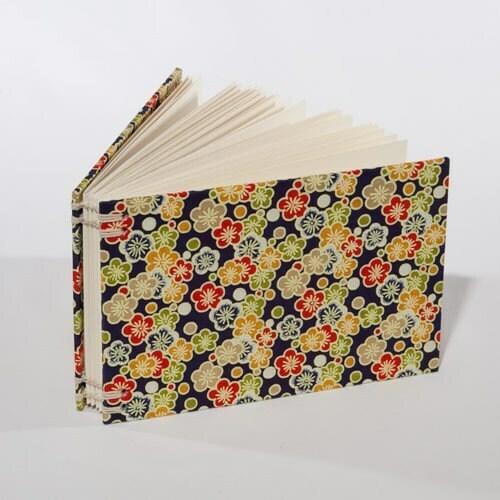 When I created my Etsy shop I realized I already had an online presence and so it just seemed natural to work in my love of bookbinding with my love of reading. Several years ago I was in Hildesheim, Germany and I attended a university exhibition from the students in the design school and I saw some artists books. I had never really thought of different bindings and structures before but that evening my love for books took on a new dimension I guess you could say. 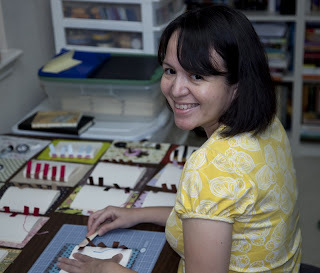 When I came back to the States I thought about how I could make my own book and luckily I was able to find a local craft guild and took classes there. I’ve been making books for six years now. That's funny, because in my reception (I am German) the playful implementation of different binding styles in modern bookmaking seems to be an American! Do you remember what kind of exhibition this was? Unfortunately I don't remember the name of the exhibit, or what exactly was on display - it was about 10 years ago! I didn't see that many unusual bindings, I guess, but I did see some artists' books and I guess I had never thought about books like that so it really was a new discovery for me. 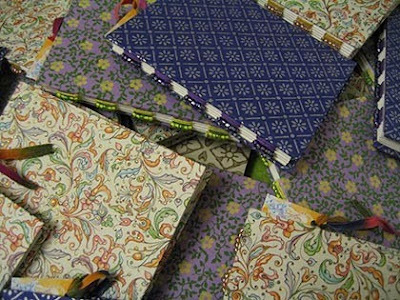 So you found you love for bookbinding while you were abroad. Do you travel a lot? My husband and I love to travel. Every year we go to northern Germany to visit my husband’s family and if we have enough vacation time we’ll try to go to another place in Europe. I love taking pictures, going to museums and flea markets, and of course visiting bookstores. Do you have special plans for your crafting and your shop for the future? 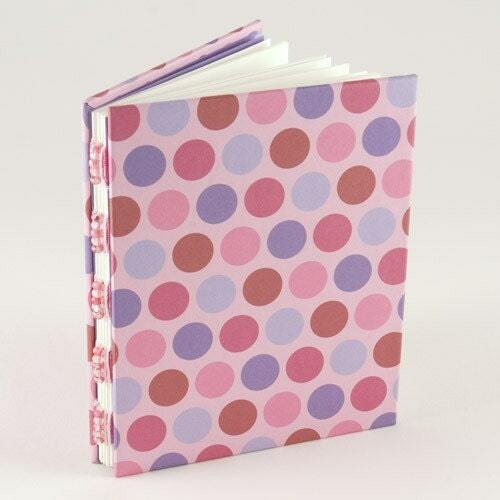 This year I would like to start adding books with different bindings and materials to my shop. For example, I like giving old books a new life so repurposing old books to make new journals would be one of the items I'd like to start adding to my inventory. My husband is a wonderful calligrapher and I hope that one day we can collaborate on one-of-a-kind books. I also dream about taking a letterpress class, learning silkscreen printing, sewing and lately I’ve added knitting to my list. That sounds like some fun projects! I wish you good luck with giving them life. Thank you for talking with me, and letting us in behind the scenes of bookgirlsstudio! If you want to see more of Iliana's work, visit her shop at bookgirlsstudio.etsy, or her blog at www.bookgirl.net. These are really pretty books! I love the beaded spine decorations. Definitely a cute little niche market for Iliana! Beautiful! I really like the last ones with the Florentine-looking paper. What talent. I received one of Iliana's books as a gift, and they are even more gorgeous in real life!